This will be my first Cloud Field Day, I wasn’t lucky enough to attend as a delegate, I put this down to the fact that I managed to get myself into vendor land around the same time I was really putting a lot of effort into this blog and other social media facets. However, I have been a huge fan of the Tech Field Day brand and I would often find myself keeping a keen eye on the various sessions that were happening throughout the year. Ever need to see in a few short videos what a company is doing in a space, then Tech Field Day videos is the place to head. Anyway, what are we going to cover in our session at Cloud Field Day 5 – April 2019? David Hill will kick things off and talk about how Veeam over the last 18 months – 2 years has been focusing on broadening the platform. Platform you say. Yes there are still a lot of people out there that will know Veeam as the virtualisation backup company protecting VMware and Hyper-V machines in an agent less fashion, whilst this is still a huge focus its not all we have within the platform, we also have our physical agents for Windows and Linux which are also the go to when you don’t have access to the underlining hypervisor for the agent less approach, as well as these we also acquired some code at the beginning of 2018 that allows us to protect AIX and Oracle Solaris workloads (Let’s not get into that too much here though, not very cloudy). Next up we have the huge topic of the public cloud or cloud in general, from a public cloud point of view we have had a story with Microsoft that allows us to do certain things in that cloud (more on this later on) and AWS was the flavour of 2018, at the beginning of 2018 Veeam acquired a company called N2W Software, David Hill will touch on this further when we get to his section. We will also share briefly how things are going in terms of revenue, customer numbers and that input of VC money we landed at the beginning of this year, with a pure focus on mergers and acquisitions. 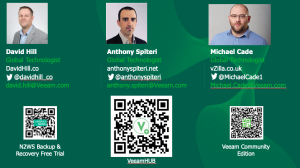 Back in the day when Veeam were concentrating on VMware and Hyper-V backups, the smart people in Veeam R&D were already thinking about the future and the portability of data. Fast forward to now when we have this Veeam Availability Platform that can protect 3 different hypervisors, physical agents for Windows and Linux and the capability with N2W Software to be able to protect AWS EC2 instances all backing up into the same portable data format. This data format allows Veeam to assist with the movement or migration of data. This is one of the corner stones as to why Veeam will win in the Cloud Management era. The other huge benefit is the fact that there is so much choice on where you store those portable data formats. NAS, SAN, DAS, Deduplication Devices as well as choose your own file system. XFS, ZFS, NTFS, ReFS etc etc. Finally, all of this can be combined into something we call Scale Out Backup Repository. This is our ability to pool those different storage and file systems together to make a combined target. Ever wondered how you get those on premises workloads from there to the public cloud, namely Microsoft Azure or AWS? Well this is the capability and feature I will be showing during our session. We are going to take that portable data format and we have the choice of where we want to send that and spin up that workload. This can be any of those sources mentioned in the last section and taking those restore points and sending them to the public cloud. We can also convert the disks from those sources to VHD and VMDK again regardless of where they come from. I will also be showing how this can be done from PowerShell which then adds another use case to be able to automate this process into other integrations. Anthony will be up next to go deep into the Cloud Tier, the introduction to be able to tier your backups from your operational restore window that sits on premises to an object storage repository, this could be any S3 compatible, Microsoft Azure Blob Storage or AWS S3. This is a huge differentiator for Veeam in how we store the data in the object storage but also how we are extremely efficient when it comes to recovery. This section will talk firstly about the ability to take those machines that I have restored into AWS as EC2 instances and how Veeam Availability for AWS will then be able to start protecting those workloads. Namely using the tags functionality to see and protect these new workloads but also leveraging that technology from N2W Software. The important thing I want to mention here is the ability to take those instances from on premises and migrate them to AWS doesn’t require a new license, with the new Instance Based Licensing wherever that workload lives its covered. Anthony will come back on and cover off in a quick-fire round some of the other areas that we have in the Cloud Data Management space. Firstly, covering the power of Veeam Cloud Connect for both BaaS and DRaaS, he will also cover our ability to protect Microsoft Office 365 and finish up on some great stuff around vCloud Director good stuff that we have. We will then wrap things up highlighting those key differentiators. Simple, Reliable and Flexible. This all starts with that Portable Data Format, the ability to protect any workload to the same format brings so many benefits as you can see above but also it also allows users and customers to always be able to restore from Veeam Backups regardless if you are a maintenance paying customer or not. Veeam has the ability to take those backups and you can either restore at a granular level using Veeam Community Edition (FREE) but also the ability to use the Veeam Extractor Utility which works like your beloved zip file software, want to extract the contents out of a Veeam Backup File then sure use the Veeam Extractor Utility on either windows or Linux to extract those files without having to install the Veeam Backup & Replication software.